With the holiday season upon us, those of us with newly diagnosed allergies begin to fear the exchanging of chocolate boxes and homemade gift baskets filled with the enemy allergen. Yes, many of our holiday favorites consist of almost all the major food allergens: wheat, eggs, dairy, nuts and soy. But don’t cancel Christmas without calling in the substitute. Your Christmas traditions can still go on – with one simple tweak, we can save the seasonal sweets! 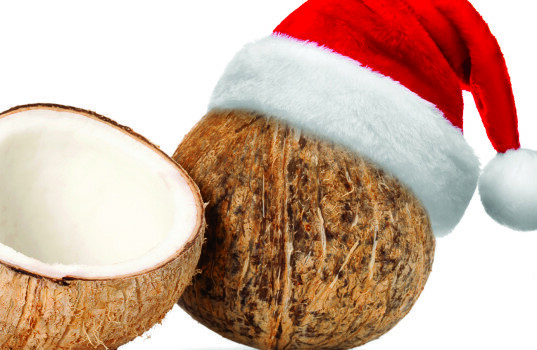 The small, yet powerful ingredient of coconut can replace many of the eight major allergens in our Christmas cookies, pies and pastries. Fear not, the satisfied smiles and chocolate-fingered hugs will return this Christmas season. Try substituting the different forms of coconut listed below in your holiday baking and invite the whole family to join in the festivities — allergies and all. This well-rounded island essential has become a kitchen essential in my house. Coconut milk replaces the dairy from regular milk with a perfect 1:1 ratio. Whether canned or refrigerated, the creamy drink easily blends in with the rest of the ingredients while simultaneously pleasing the palette with an extra velvety richness. Coconut butter kicks regular, dairy butter out of the park. With the same melting rate and mixing consistency as butter, this ingredient perfectly replaces the old and opens up a whole new dimension for kids with dairy intolerances. Break out the holiday sugar cookie recipe and give coconut butter a try! The semi-solid oil takes a little getting used to when it comes to cooking and baking. The oil can replace any vegetable or olive oil easily — but more importantly it can take the place of an egg. The conversion process is easy: for every two eggs, replace with ¼ cup coconut oil. Since coconut flour is a little softer in composition and less adhesive than wheat flour, it has to call in for a little assistance from another derivation of flour. I recommend combining almond flour and coconut flour for a more complete replacement. In most recipes, half almond and half coconut flour will do the trick. When mixed with the coconut flour, the almond balances off the sweeter, flakier element for a full-bodied, ready-for-baking flour. Holiday pie has never tasted so good! Sugar may not be listed as one of the top allergens, but lately issues such as diabetes, insulin surges and dietary sugar limitations have become more of a concern. Coconut sugar essentially resembles white sugar, yet contains many more health benefits. With a low glycemic index, coconut sugar can take the place of a white or brown sugar ingredient with a 1:1 conversion ratio. Looking for something unconventional to top your pecan-less pie or wheat-free pastry? Adding this textured element to a recipe will exchange the crunch of nuts with the flavorful, flaky chew of coconut in every bite.